You'r Invited to Jump In! Take a splash at Sterling National's expansive swimming pool complex, complete with competition lanes and a separate children's pool. 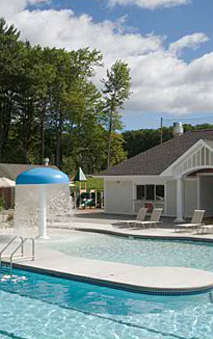 Our state-of-the-art pool complex is one of the coolest spots in Central Massachusetts. Our sparkling seasonal outdoor pool complex will envelop you with peace, tranquility and relaxation. soak up the sun, read a book or play a game of cards under one of our umbrella-covered tables. or pamper yourself with pool-side food & beverage service, delivered by our friendly and professional staff. A specially designed children’s pool, complete with fun-in-mind spray fountains, will provide hours of cool, splashing entertainment for the little ones. Sterling National's pool facility is open to members only - so you can enjoy exclusive pool privileges and peace of mind. The region's most family-friendly country club just got even more family-friendly. now is the perfect time to join!